Dr. Oldfield was my pituitary surgeon at NIH back in 1987. This was back in the olden days of transsphenoidal surgery. I honestly expected to die but this man saved my life. 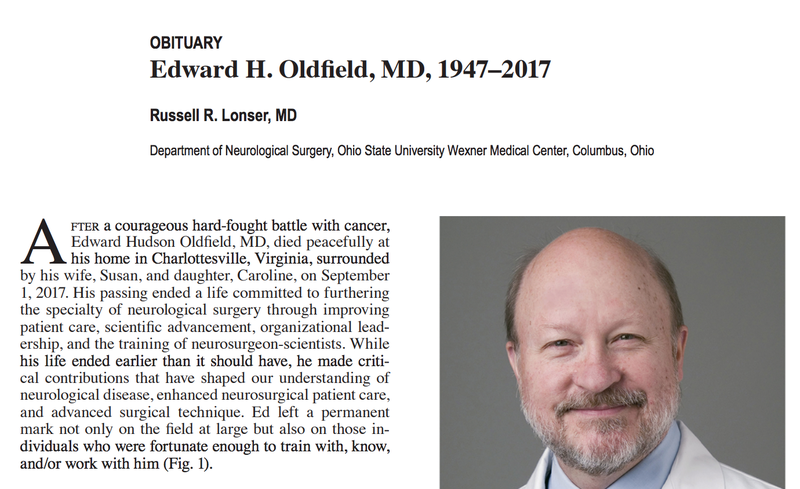 Ed started as Senior Staff Fellow in the Surgical Neurology Branch at the NIH (1981). After 5 years, Ed would become the Chief of the Surgical Neurology Branch. He would stay on as Branch Chief and lead the neurosurgical effort at the NIH for the next 21 years. During his tenure, he developed clinical, research, and training programs in epilepsy, congenital malformations, syringomyelia, nervous system neoplasia, drug delivery, and vascular malformations. The strength of these programs was his leadership and their multidisciplinary nature, which incorporated physicians and scientists across the basic, translational, and clinical arenas. Research investigation was always targeted at defined clinical problems. Under his direction, these programs shaped understanding of the studied neurological disorders, as well as improving patient care.